Stefan Milenkovich (Milenkovic) is a Serbian violinist and teacher born (in Belgrade) on January 25, 1977. He began studying at an extremely young age – age 3, just like Jascha Heifetz. His first teacher was his father – again, just as Heifetz’ father was his first teacher as well. As have other famous violinists – Bronislaw Huberman, Bronislaw Gimpel, Leonora Jackson, Julia Igonina, Hilary Hahn, Natasha Korsakova, and Chloe Hanslip among them - he has performed for world leaders, including President Reagan, President Gorbachev, and Pope John Paul II. By age 6, he had already given his first public concert. By 1994, he had played over 1000 concerts. He was only 16 years old. Ruggiero Ricci played over 5000 concerts by the time he retired at age 85. That is probably a world record, although I am not sure about that. At the rate he was going, Milenkovich would have to play until age 57 before he would surpass the 5000 number; however, few concert artists nowadays play more than 50 concerts per season. Also in that year (1994), Milenkovic graduated from the University of Belgrade. He then began studying in New York with Dorothy Delay at Juilliard. In 2003, he began teaching at that same school. He was 26 years old. All the while, he was concertizing all over the world. He has been known to dance - in the fashion of Maxim Vengerov - during special recitals. Three other violinists that I know of are (or were) also very good dancers; Jean Marie Leclair, Andrew Sords, and Tai Murray. As does Simone Lamsma, Milenkovich loves violin competitions and has won a number of them or placed in the top three, including the Indianapolis, the Queen Elizabeth, the Yehudi Menuhin, the Paganini, and the Spohr competitions. He has recorded several CDs which are easy to find on the internet. Currently he teaches at the University of Illinois at Champaign-Urbana (about 130 miles south of Chicago) and at the University of Belgrade (since December 26, 2011.) Here is one of many YouTube videos of him – it features Sarasate’s Zigeunerweisen. 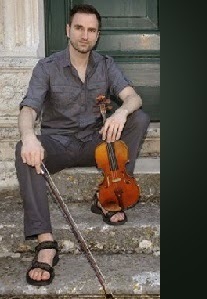 Milenkovich currently plays a modern violin - a 2006 violin by Chicago luthier Peter Aznavoorian. I wonder what kind of violin he uses?